Whose server is always online. Along with other, currently reading this book and its a beautiful one. This is a kind of book where the author himself recommended to read it from anywhere, any random page. I liked his take of 99 Qualities of Divine and naming / channeling them as Pathways to the Heart. The 99 Qualities / Names of Divine are revealed through Prophet Muhammad and contain essential Gnosis of God. About the Book | Part meditation book, part oracle, and part collection of Sufi lore, poetry, and stories, The Sufi Book of Life offers a fresh interpretation of the fundamental spiritual practice found in all ancient and modern Sufi schools - the meditations on the 99 Qualities of Unity. Unlike most books on Sufism, which are primarily collections of translated Sufi texts, this accessible guide is a handbook that explains how to apply Sufi principles to modern life. With inspirational commentary that connects each quality with contemporary concerns such as love, work, and success, as well as timeless wisdom from Sufi masters, both ancient and modern, such as Rumi, Hafiz, Shabistari, Rabia, Inayat Khan, Indries Shah, Irina Tweedie, Bawa Muhaiyadden, and more, The Sufi Book of Life is a dervish guide to life and love for the twenty-first century. Neil Douglas-Klotz, Ph.D ., internationally-known scholar of religious studies and psychology, is author of Prayers of the Cosmos, Desert Wisdom, The Hidden Gospel and The Genesis Meditations: A Shared Practice of Peace for Jews, Christians and Muslims. He is co-chair of the Mysticism Group of the American Academy of Religion and currently lives in Edinburgh, where he codirects the Institute for Advanced Learning. 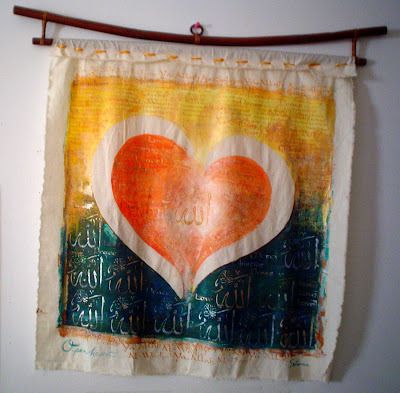 He founded the International Network for Dances of Universal Peace in 1982 and is a senior teacher of the Sufi Ruhaniat International through which he has led spiritually rooted peace-seeking journeys to Russia, Eastern Europe, Syria, Jordan, and Israel.
. graphics: photograph of an artwork from Shadhiliyya Sufi Center, Napa Valley.